A 53-year-old man has been remanded in custody charged with the murder of a schoolgirl more than 30 years ago. Ronald Castree, of Brandon Crescent, Shaw, Oldham, Greater Manchester, appeared at Calderdale Magistrates' Court in Halifax, West Yorkshire. He is accused of murdering 11-year-old Lesley Molseed in 1975. On 5 October 1975, she left her home in Delamere Road, Rochdale, on an errand. Three days later her body was found on moors in Ripponden, West Yorkshire. She had been stabbed 12 times. Chairman of the bench Steve Jenkinson remanded Mr Castree in custody to appear before Bradford Crown Court on 14 November. During the brief hearing, members of Lesley's family shook their heads and cried in court as they heard legal arguments about the case. The defendant spoke only to confirm his name, age, address and that he understood the charge. The court heard he was charged with Lesley's murder between 4 October and 9 October 1975 on Rishworth Moor above the A672 Oldham to Halifax Road. After a major investigation in which nearly 5,000 statements were taken and more than 12,000 people spoken to in the first three months, 26-year-old Stefan Kiszko, a tax clerk from Rochdale, was convicted of Lesley's murder. He spent 16 years in prison before finally being released following an appeal but died shortly afterwards. 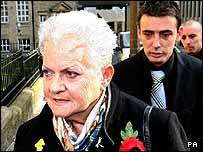 At the time West Yorkshire Police vowed to keep the murder investigation open until the youngster's killer was found.